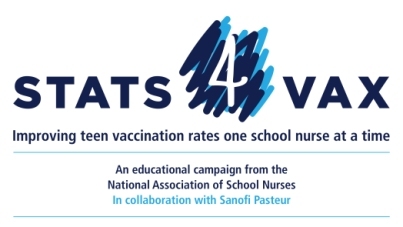 Stats4Vax: Improving teen vaccination rates one school nurse at a time (Stats4Vax), a collaboration between NASN and Sanofi Pasteur, aims to improve teen vaccination rates by providing support, materials, and tools for school nurses and other healthcare providers to help guide conversations with parents/guardians to see that their teens are up-to-date on their immunizations. To help improve vaccination rates in your schools, we’ve created the Stats4Vax Resource Library. Below, you'll find easy-to-use materials that you can tailor to meet the needs of your student population. Materials and tools include letters home to parents/guardians, a talk track with messages to help you proactively discuss the importance of vaccination with students, and content to help educate parents/guardians about teen vaccination to use via social media, school newsletters, or the school website. We hope you use these materials and tools when speaking with your students’ parents/guardians about the importance of vaccination! Centers for Disease Control and Prevention (2016). Vaccines for Your Children: Protect Your Child at Every Age. Retrieved from http://www.cdc.gov/vaccines/parents/protecting-children/index.html. Centers for Disease Control and Prevention. (2015). National, Regional, State, and Selected Local Area Vaccination Coverage Among Adolescents Aged 13–17 Years — United States, 2014. Retrieved, from http://www.cdc.gov/mmwr/preview/mmwrhtml/mm6429a3.htm. Page last updated October 2017.